Medium to full-bodied with ripe dark loganberry fruits, good concentration and a nice dry finish. Great value for money and perfect with beef dishes. I managed an hour at the Argentina tasting in Dublin last week, and this year concentrated on Malbec. This is what the world wants at the moment, although I reckon Argentina makes some pretty tasty Cabernet as well. 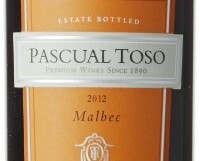 I have been a fan of the Pascual Toso Malbec for many years. It is consistent and reasonably priced, despite the dollar-euro exchange rate.